DENAUT, PIERRE, Roman Catholic priest and bishop; b. 20 July 1743 in Montreal (Que. 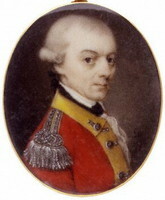 ), son of André Denaut and Françoise Boyer; d. 17 Jan. 1806 in Longueuil, Lower Canada. Pierre Denaut, the seventh son of a Montreal mason, went to the Latin school run by the Sulpicians in Montreal and then in 1758 entered the Petit Séminaire de Québec. 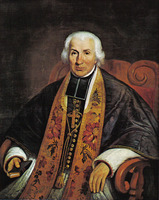 In the summer of 1759, before the British bombardment of Quebec began, he took refuge at the Séminaire de Saint-Sulpice in Montreal along with some fellow students and a few teachers; there he continued his studies and began his theology, having received a scholarship of 100 livres from the foundation created by Bishop Saint-Vallier [La Croix*]. He was still studying when he held the position of secretary to Étienne Montgolfier*, vicar general of Montreal, and then to Étienne Marchand*, also vicar general of Montreal and the parish priest of Sainte-Famille at Boucherville. 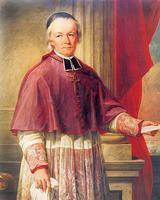 On 25 Jan. 1767 Bishop Briand* ordained him priest in the Île d’Orléans church of Saint-Pierre. Then he appointed him parish priest of Saint-Joseph, at Les Cèdres, with responsibility for the mission chapel of Saint-Michel, at Vaudreuil, and Denaut served in this position from 5 Sept. 1773 to 30 Oct. 1775; he was subsequently named to Île Perrot, where he remained from 16 Jan. 1786 to 14 Oct. 1787. In 1788 he was made an archpriest, and on 25 October of the following year he became parish priest of Saint-Antoine at Longueuil, a charge he held until his death. This parish was prosperous and its people were, according to Denaut, “good, docile, religious.” Except for one occasion, when some “stubborn people” reproached him for living too luxuriously, Denaut maintained excellent relations with his parishioners. He had two nephews and a niece staying with him, he associated with the neighbouring seigneur of Longueuil, David Alexander Grant, and once a week he visited a colleague or had a meal at the Sulpician seminary in Montreal. He led a regular life given over to pastoral duties, prayer, and study. 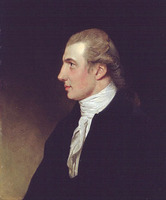 He opened a primary school which some 15 pupils were attending in the 1790s. Bishop Hubert* held Denaut in high esteem. 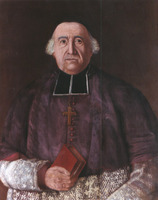 In 1790 he raised him to the rank of vicar general. 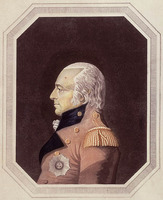 Then on 26 May 1794 he informed Lord Dorchester [Guy Carleton] that from among the candidates whom Dorchester had suggested to him he was choosing Denaut as coadjutor to replace Charles-François Bailly* de Messein, who had died a few days earlier. Hubert reported this selection to Rome, stating that the future bishop’s personal qualities, “his love of ecclesiastical discipline, his respect for the Holy See . . . [created] the most auspicious prejudice in his favour.” Pius VI gave his approval in a bull dated 30 Sept. 1794, and Hubert proceeded to consecrate the new bishop in the church of Notre-Dame in Montreal on 29 June 1795. With his assent Denaut remained in Longueuil, and from there attended to matters in Montreal. On 1 Sept. 1797 Hubert, “worn out by fevers and fatigue,” resigned in favour of his coadjutor. The tenth bishop of Quebec was a modest, humble, reflective man, touchy at times, yet filled with the desire to serve “the glory of God and the public good.” He became head of the Roman Catholic Church in Canada amid difficult circumstances: the diocese was immense, and the church was in a precarious state. Although he bore the title of bishop of Quebec, the British government recognized him as the superintendent of the Catholic Church in Canada. He had neither a salary nor official prerogatives. 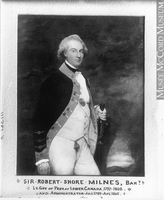 Certain ecclesiastical appointments were made in concert with Lieutenant Governor Robert Shore Milnes*, whom he had to inform of all other appointments. The government was disputing the ownership of the bishop’s palace with him. He lacked priests; discipline and training among the clergy left something to be desired. The women’s communities were poor and short of people; the men’s, not having civil recognition, were quietly dying out. To the evils that had become commonplace – drunkenness, bad books, mixed marriages – had been added in 1793 the presence at Quebec of Jacob Mountain*, the first Anglican bishop and a member of the Legislative Council. This man, who was full of a sense of his prerogatives and who wanted to subject the Catholic Church to the royal supremacy, had solid connections in the civil government, such as the clerk of the Executive Council and civil secretary to the governor, Herman Witsius Ryland*, and the attorney general, Jonathan Sewell*. Denaut administered his diocese from Longueuil, not from Quebec. This was an unusual gesture. A humble spirit, more pastor than politician, more anxious to administer his church than to enhance its civil status, Denaut may have preferred the calm of Longueuil to the busier life at Quebec. Perhaps it was a strategy that had been devised in Hubert’s time to achieve gradual British acceptance of the idea of a bishop in Montreal: “Once this step has been taken,” Hubert may have thought, “we can try something more.” If this was the case, the strategy had many disadvantages, one being that the slowness of communications was a possible source of misunderstanding between the bishop and his coadjutor at Quebec, especially when the latter had to deal quickly with the civil authorities. However that may be, Denaut’s first gesture, following the example of his predecessors, was to ensure the survival of his church. 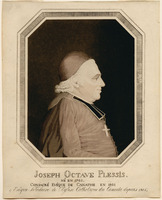 On 2 Sept. 1797 he took the oath of allegiance along with Joseph-Octave Plessis*, whom Hubert had chosen as coadjutor and had accepted by Governor Prescott. On 10 September Denaut asked the prefect of the Congregation of Propaganda to approve the choice of Plessis for the coadjutorship so that the episcopal succession would be assured. Denaut and Plessis, two complementary personalities, esteemed each other highly without, however; always understanding each other: the former watched over principles, the latter, who maintained “social relations” with the chief justice and the Anglican bishop, carried on the negotiations with the government. These were all the more numerous since Mountain went to work to defend his prerogatives, and some Protestant politicians to limit the powers of the Catholic bishop. 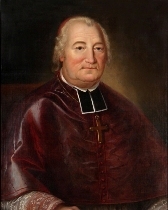 Late in the winter of 1798, when a bill to create the parish of Saint-Grégoire, at Bécancour, was introduced in the House of Assembly, some members disputed the bishop’s authority to set up parishes canonically. Denaut entrusted to his coadjutor the lobbying of the government needed to obtain passage of a general bill, “reforming and amending the ordinance of 1791,” that would clearly give to the bishop and the governor the authority to create parishes. This question, like the one concerning the Royal Institution for the Advancement of Learning in 1801, was only the visible tip of an anglicizing movement whose aim, set out by Sewell that same year in his report on the religious situation in Lower Canada, was to subject the Catholic Church to royal authority. The means envisaged by the attorney general included the exercise by government of the right to appoint parish priests, the attachment of the Catholic hierarchy to the political order through government stipends, the exclusion of foreign priests, and the official recognition of the episcopal function in order to bring its holder under tighter control. On the advice of Jean-Henri-Auguste Roux*, vicar general and superior of the Sulpician seminary in Montreal, Denaut adopted an intransigent attitude but a defensive strategy that was centred on cordial relations with the lieutenant governor and the presentation of memoirs setting out the rights of the Catholic Church. The general line was to demand nothing, but to take all possible advantage of a régime that was tolerant. 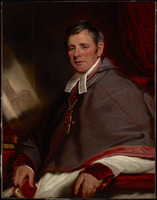 In 1805, when Milnes took it upon himself to ask London for a “commission” which would give the Catholic bishop a status similar to that of his Anglican counterpart, Denaut, who under the circumstances wanted “only the continuation of tolerance, support, protection,” became concerned. Sewell’s demands prompted him to prefer “a precarious state” to a “solid establishment” that would strip the bishop of his basic rights. He was ready to resign rather than agree to what was being proposed to him. 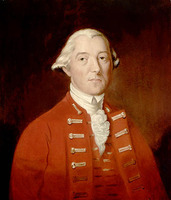 Denaut considered the request to London inopportune: the British government, which was deeply involved in European affairs, would not have time to amuse itself “with bagatelles.” He was afraid of the clique leading the Lower Canadian government, not Milnes himself, who “is too wise and too much a politician to let himself be swept away” in the direction that Mountain wanted. Denaut’s pastoral and administrative work is of some interest. He managed his diocese with the help of a coadjutor at Quebec and of vicars general in each of the districts of Lower Canada, a vicar general in the Maritimes, and another in Upper Canada. He made a tour, visiting Kingston and Detroit in 1801, some parishes in Upper Canada the following year, and the Maritimes in 1803. These exhausting journeys could have been enough to convince him of the necessity of subdividing his diocese. Such a plan was favoured by the Congregation of Propaganda, which, in accordance with the desire that Hubert had formerly expressed, twice suggested to Denaut the creation of suffragan dioceses. But the bishop considered this suggestion premature: the government would put obstacles in the way, and the resources needed for establishing new diocesan churches were lacking. He preferred to postpone settlement of the problem, and concentrated his efforts on strengthening discipline in the clergy and among the faithful, providing for the spiritual needs of the parishes and missions, and improving the situation of the religious communities. In these matters he was inflexible. The seniority and the merit of the candidates were the two criteria that he took into account in appointing parish priests. He did not allow dispute over the choice of sites for churches once he had had consultations and had made a decision in all justice and equity, and he insisted that parish priests be assured of a decent living. Thus he did not hesitate to threaten recalcitrant parishioners with being deprived of the sacraments from a resident priest if they did not provide for his upkeep or even with not having a church at all if the site for it were disputed. “The cross is raised; the church will be built there, or nowhere,” he told the dissatisfied members of the parish of Notre-Dame-de-la-Visitation at Champlain. He began to levy charges for certain dispensations that he granted, both “to strengthen the sinews of discipline” and to provide the bishop with the income to administer his church. He put an end to the celebration of patronal feasts in parishes where they gave rise to disorders. He followed the situation of the communities closely, advising the Jesuit Jean-Joseph Casot* in his relations with the government and helping the nuns of the Hôtel-Dieu in Montreal to reorganize their finances and the Sulpicians to finance the building of their seminary. Denaut died at Longueuil on 17 Jan. 1806, after being ill only a few hours; he was buried three days later in the parish church. In keeping with the instructions in his will, dated 3 May 1803, the executor, Pierre Conefroy, had an inventory made on 27 Jan. 1806 of the deceased’s property, which he then put up for auction on 24 and 25 February. Denaut left personal effects that were sold for 12,000 livres and that included a library of 418 volumes, consisting of 106 titles among which were works of Rousseau, Voltaire, Raynal, Molière, and Racine. In addition he left two sums of money, one of £489 11s. 8d., the other, which came from tithes and debts owed him by the fabrique, of 1,190 livres; accounts receivable, which were set at some 24,000 livres, including a piece of land at Nicolet that had been sold to Plessis for 5,000 livres; settled annuities with a capital of 51,986 livres, 31,200 of which had been lent to René Boucher de La Bruère; and title-deeds to 200 acres in York Township and two properties of 120 acres each that had been granted in the Madawaska region (Que./N.B.). From these assets were deducted the debts he owed, estimated at 15,054 livres. The difference constituted the legacy bequeathed to his great-niece Marguerite-Amable Denaut, who was to pay Denaut’s sister an annuity of 600 livres a year. If Pierre Denaut’s portrait shows us a man with a round, chubby face marked by good nature, his correspondence reveals a thoughtful and energetic will, a mind full of humour, a man respectful of his associates, magnanimous to those close to him and to his flock, and appreciative of the attentions that each and every one lavished upon him. Having lived at a period when passive resistance was the best guarantee of survival for the Catholic Church in Canada, he left few traces in the collective memory. [Although Henri Têtu includes a short account of Pierre Denaut in Notices biographiques; les évêques de Québec (Québec, 1889; réimpr. en 4v., Québec et Tours, France, 1930), 76–111, there is as yet no full biographical study and historians have examined his career only in relation to particular issues. 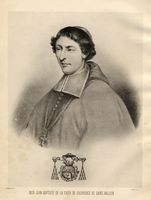 Bishop Denaut’s papers, or rather those remaining after Pierre Conefroy “burned everything that was not related to Denaut’s private affairs or to parish ministry,” are scattered: his correspondence for the years he was priest of Saint-Joseph, at Les Cadres, Que., and of Saint-Antoine, at Longueuil, is held, respectively, by the Archives de la chancellerie de l’évêché de Valleyfield (Valleyfield) and the Archives du diocèse de Saint-Jean-de-Québec (Longueuil). The correspondence during his episcopacy as well as the records of his administration are at AAQ, 210 A, II; IV. There are also a few documents concerning Denaut at the ASQ, but its holdings consist mainly of copies of items at the AAQ. Complete indexes are available to the materials at the AAQ and ASQ, and an inventory is published in Caron, “Inv. de la corr. de Mgr Denaut,” ANQ Rapport, 1931–32: 129–242. 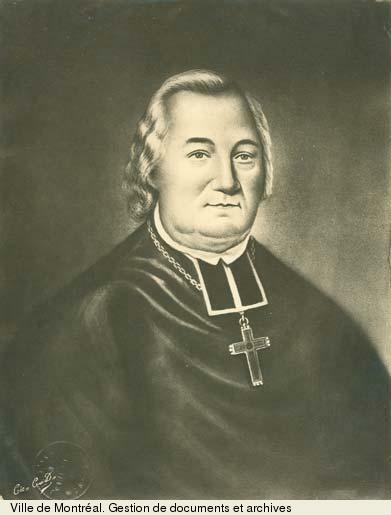 In addition, most of Bishop Denaut’s episcopal pronouncements have been published in Mandements, lettres pastorales et circulaires des évêques de Québec, Henri Têtu et C.-O. Gagnon, édit. (18v. parus, Québec, 1887– ), 2: 509–50. Finally, Têtu published extracts from Denaut’s diary and from his correspondence with Plessis in “Visite pastorale de Mgr Denaut en Acadie en 1803,” BRH, 10 (1904): 257–68 and 289–300, as well as an account of Denaut’s trip to Detroit in 1801 in “Requête des voyageurs de Michillimakinac en 1786,” also in BRH, 10: 97–106. ANQ-M, CE1-12, 17 janv. 1806; CE1-51, 21 juill. 1743; CN1-74, 3 mai 1803; 27 janv., 24, 25 févr. 1806. PAC, MG 11, [CO 42] Q, 68: 191; 92: 2; 98: 5; 100: 8; 101–1: 401; 112: 158; RG 8, I (C ser. ), 63: 105–8; 206: 46; 512: 131. Quebec Gazette, 23 Jan. 1806. Lambert, “Joseph-Octave Plessis.” Lemieux, L’établissement de la première prov. eccl., 41–58, 65, 73. Robert Rumilly, Histoire de Longueuil (Longueuil, 1974), 76–111. Wallot, Un Québec qui bougeait, 169–224. Jean Hamelin and Michel Paquin, “DENAUT, PIERRE,” in Dictionary of Canadian Biography, vol. 5, University of Toronto/Université Laval, 2003–, accessed April 24, 2019, http://www.biographi.ca/en/bio/denaut_pierre_5E.html.